Our partners are just that – partners. And no two partners are alike. With that being said, each of them should plan and execute marketing initiatives that feature their own special property highlights, and whatever their brand stands for: what is special and different and remarkable to the legions of golfers who have graced their fairways over the years. We work with each golf property to create promotions that not only generate significant, untapped revenue, but also advance their branding objectives. We become a resource they turn to for marketing support. As part of that relationship, we share best practices and tools to help them grow their business and golfer footprint. For us, and for each of them, a true partnership through and through. 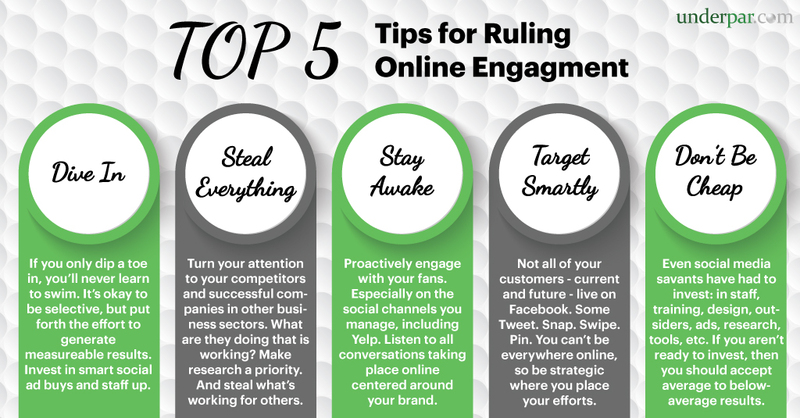 Enjoy our Top 5 Tips for Ruling Online Engagement. For more resources and to learn about UnderPar promotion solutions, contact Greg Knuth, UnderPar US Director, at Greg@UnderPar.com or 619-757-7963.